Anti Piracy Solution | PACE Anti-Piracy, Inc.
Fighting software piracy is an ongoing battle; it means lost revenue, marketshare , and your reputation as a publisher could be at stake. Unauthorized copying and distribution accounted for $2.4 billion in lost revenue in the United States alone in the 1990s,** and is assumed to be causing impact on revenues in the music and the game industry, leading to the proposal of stricter copyright laws such as PIPA and the DMCA. Everyone knows that illegally sharing software is wrong, yet it still happens every day. Lowering the barrier to entry by removing copy protection, or moving to a flimsy, online pay wall model has been proven ineffective at preserving software integrity. Our research has shown that a hacker’s intentions are difficult to predict. Sometimes, they wish to crack very expensive software to deliver it to the masses; other times, they crack software for sport and recognition amongst their peers. This makes anti piracy protection an important factor to consider if your goal is to make money. Not only do hackers offer product for free but they often abuse copyrights as well. Another point to consider is how an anti piracy solution can protect your companies brand, perhaps your greatest asset. Good anti piracy software protects your executable inside and out and makes your product tamperproof. Our research has also shown us that global hackers are not as concerned about giving away your software for free, but rather they see your success as a vehicle to steal precious and sensitive information from your audience. By reverse engineering and inserting malware, hackers can gain access to your customers’ data and computers. If you have not adopted stringent anti piracy software protection practices, experienced hackers can quickly and easily infiltrate your distributions and ruin your company’s reputation. With open communication readily available in social media, it is even more imperative, as your potential customers will run from your product offering if they feel they cannot trust it. Hackers are relentless. Their community is large and they are becoming more and more brazen with their attacks and frequency. They communicate with each other and will even crowdsource their efforts to take a software title down. They hate anti piracy protection and may often engage in a smear campaign to make software publishers believe that an anti piracy solution will hurt their bottom line. Common arguments are that the anti piracy copy protection scheme is cumbersome and a hassle for the end user. Sadly, many publishers believe this when in fact, we have the data to prove the contrary. You would be mistaken to think that an anti piracy solution is a one-time cost, a set it and forget it investment. We have seen good, strong, expensive anti piracy software from our competitors hacked within days of being posted. Sadly, in some cases protected software lasts only hours in the wild. How do you combat this threat? Will any anti piracy solution work for your needs? We can help you with this fight. We have anti piracy solutions that are proven to be effective in protecting your company’s revenue stream. Before we delve into discussing anti piracy software, we would like to give you a glimpse into how vulnerable you could be. Most anti piracy software protection schemes rely on license checks to validate ownership. A license check validates the ownership and allows your software to run. Remove the license and the software will cease to work. A seasoned hacker can easily spot simple license checks and remove the checks without degrading the functionality of the software. Of course, as anti piracy solutions become stronger, the tools hackers write and use adapt, thereby escalating this war. 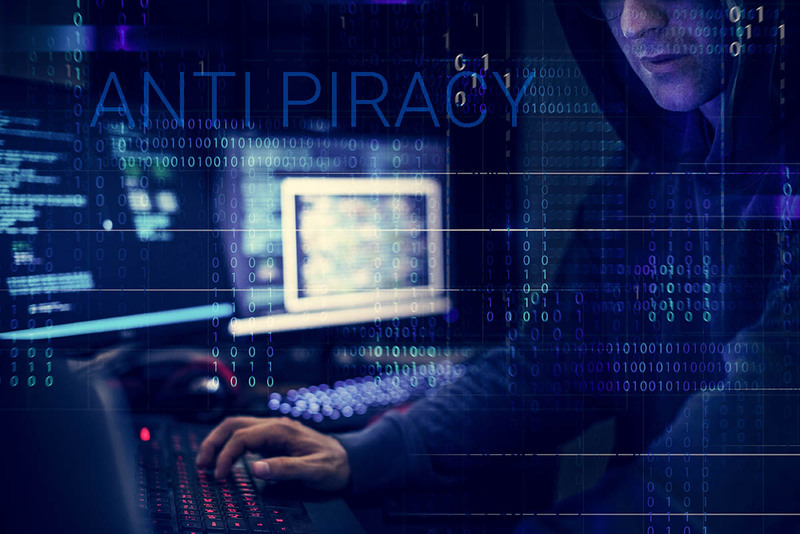 Mid-size to smaller companies, who lack the financial resources to sink into a homegrown anti piracy solution, don’t stand much of a chance, and some have sadly resigned themselves that their product will be hacked as soon as it’s released. Enter PACE Anti Piracy Inc. to fight this battle for you. We have a proven track record of over 30 years developing solutions to stay ahead of attacks on our customers: You, the publisher. Until recently, our most secure method of storing a license was on a proprietary USB iLok dongle. After some technological breakthroughs and years of development, our license servers are secure enough to deliver cloud licensing at an affordable cost AND be secure enough for us to brand with the iLok name. PACE Anti-Piracy, Inc has been in this business for over 30 years. We have seen it all and yet we are surprised at the tenacity, level of sophistication, and for lack of a better term, talent of the hacker community to quickly and methodically dismantle a publisher’s hard work and release it on a torrent site. The only way to combat these threats is to understand the motivations and methods used. We constantly monitor hacker boards and communications to understand their challenges. We look for methods that prove to be difficult for them to break. We also employ a team of reformed hackers to challenge our product offerings before they are released to our publishers. We use tested cryptography and have vast experience with anti-tamper and white box technologies. We test our anti piracy software against the most brilliant minds in the industry and we are only satisfied when they have to admit defeat. We know it sounds like an unrealistic boast to say our anti piracy software cannot be cracked. Our goal is to stay ahead of the curve and hacking trends. We avoid giving known hooks or patterns that they recognize, and we pepper our anti piracy solutions with methods that we know are time consuming and difficult, if not impossible, to remove. We are constantly innovating and investing in the future. We are constantly asked by new publishers how long it will take to implement. To answer that, we must take many factors into consideration. We like to describe the amount of protection our anti piracy software solution provides as a dial that can be turned from 1 to 10. One being a deterrent to abuse; 10 being robust protection for valuable IP. There are myriad reasons why a publisher would chose a particular anti piracy setting, it usually comes down to time available and effort required. Our solution is flexible enough to accommodate your needs. An anti piracy solution is only part of the puzzle. PACE Anti-Piracy, Inc offers product licensing that works in tandem with the tamper-proof nature of our copy protection. In all of our years in business, our licensing system and hardware dongle have never been hacked. The license the end user purchases is always visible to you with our PACE Central portal and can accommodate many licensing scenarios from a full perpetual license to a limited trial or a renewing subscription, just to name a few. We offer reasonable license distribution solutions. Please contact us to set up a discussion; we would love to understand your requirements and what you need to get to market. Publishers looking for sales information about the iLok licensing system, software security, or anti-piracy may follow this link: http://go.paceap.com/proaudio. PACE Anti-Piracy, Inc has been in this business for over 30 years. We have seen it all and yet we are surprised at the tenacity, level of sophistication, and for lack of a better term, talent of the hacker community to quickly and methodically dismantle a publisher’s hard work.